Union home ministry has demanded the state take punitive action against the officers for their violation of All India Service rules. New Delhi: The Union home ministry has demanded the West Bengal chief secretary take action against the IPS officers who joined chief minister Mamata Banerjee in her sit-in protest against the Central Bureau of Investigation (CBI) on February 4. The move could worsen the battle between the Centre and the state government. According to the Indian Express, the Union home ministry is considering punitive action – taking away the meritorious awards of the senior officers of the West Bengal police, barring them from central deputation or removing them from the list of seniority. Officials claimed the ministry has also asked the West Bengal government to take action against the officers in question for their alleged violation of All India Service rules, Times of India reported. The senior officers against whom action is sought include DGP Virendra, ADG (security) Vineet Kumar Goyal, ADG (law and order) Anuj Sharma, commissioner of police (Bidhannagar) Gyanwant Singh and Kolkata police additional commissioner Supratim Sarkar. “The central government has taken a dim view of serving officers of uniformed forces allegedly taking part in sit-in protests and dharnas of the Chief Minister in Kolkata on February 4,” Indian Express quoted a home ministry official as saying. 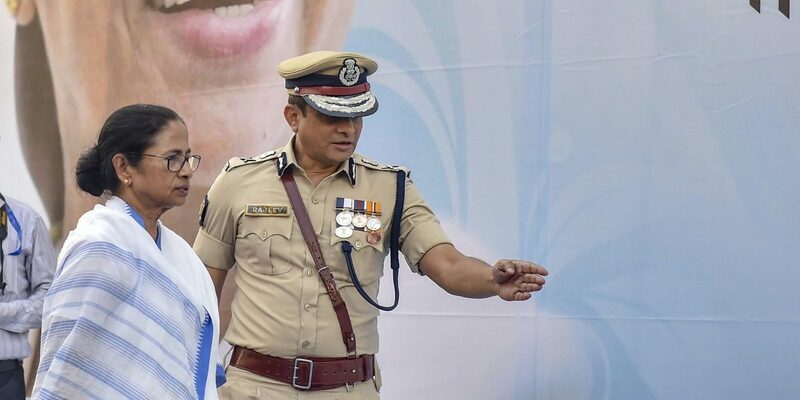 Led by Banerjee, the top Trinamool Congress leadership and West Bengal cabinet ministers hit the streets of central Kolkata on Monday against the CBI’s attempted questioning of city police commissioner Rajeev Kumar in connection with a chit-fund case probe. The chief minister organised a three-day dharna and termed the action as an attempt by Prime Minister Narendra Modi, BJP president Amit Shah and National Security Advisor Ajit Doval to organise a coup in the state. Banerjee ended the protest after the Supreme Court directed Kumar to appear before the CBI in Shillong and ordered that no coercive steps – including his arrest – will take place during the course of the investigation. Punitive steps will likely also be taken against Kumar. The action, sources told Indian Express, is based on a report from West Bengal governor Keshari Nath Tripathi. The Central government is now also considering issuing an advisory to all states to make sure that officers of uniformed forces maintain decorum, adhere to conduct rules and refrain from participating in such protests, Times of India reported.